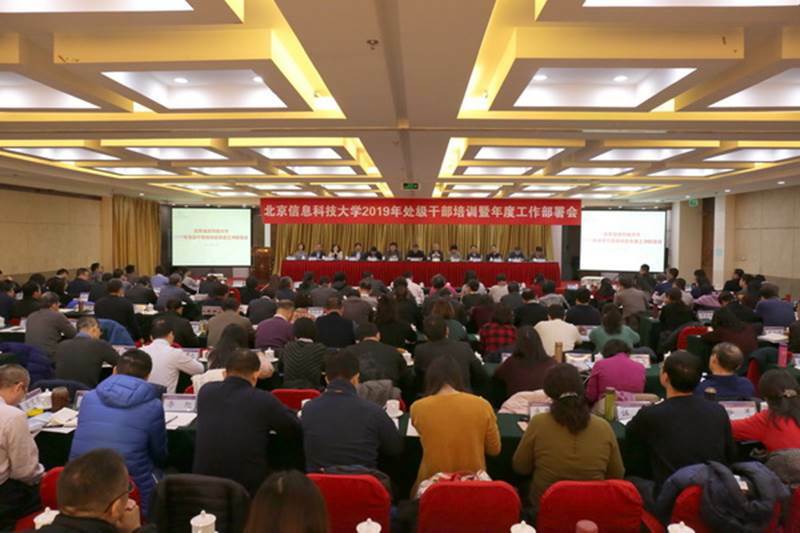 Beijing, 25th February 2019, (BISTU)— Annual conference on training of and working meeting for directors of BISTU divisions successfully completes. The conference is aimed at further implementing Xi Jinping Thought on Socialism with Chinese Characteristics for a New Era and the spirit of the 19th National Congress of CPC, clarifying development goals and missions, building a team of loyalty, cleanness, and quality, and responsibility, and investing all efforts in facilitating super normal, big-stride development of the University. The meeting is attended by Secretary General Wang Chuanliang of CPC BISTU Committee, President Wang Yongsheng, all other senior administrators, all directors and deputy directors of BISTU divisions. On the meeting, Wang Chuanliang delivers a report for all directors and deputies and clarifies the goal of “guided by ‘construction of five environments’, investing all efforts in building the best university, becoming the best of whatever you are, and writing a new chapter for development in 2019”. Firstly, Wang Chuanliang analyzes macro-situation of higher education and emphasizes that we shall be aware of new situation socio-economic development, new tendency of educational development, and new trend of the University’s development. We shall broaden our horizon, convert external pressure into internal drive, and seize every possible opportunity to achieve our goals. Secondly, he clearly points out that our major goal is to build the best university of Beijing Municipality. Wang Chuanliang emphasizes that all directors and deputies shall actively serve the big picture of national development, make our feature in information technology more salient, center more closely on education with focus on morality, and enhance the quality of teaching, research and management. Wang Chuanliang specially stresses that the year 2019 marks the 70th anniversary of foundation of New China and a key year of building moderately prosperous society. The key areas shall be attached great attention, including successful completion of key activities, successful completion of the 3rd Meeting of Party Representatives of CPC BISTU Committee, comprehensively strengthening party building, approval of doctoral programs, optimization of talent cultivation environment, facilitating construction of New Campus, risk control, and cultural development. In the end, Wang Chuanliang raise requests for all directors and deputies that they shall comprehensively improve themselves, and try their best in building a even better university. He encourages all directors and deputies that they make new achievements, realize new dreams and ambitions, and push forward work in all aspects. Wang Yongsheng reviews achievements in the past year, i.e., 84 projects accomplished in 2018 and call for all directors and deputies to deepen their commitment to the great cause of making greater achievements in the future. His address covers the aspect of: implementation of the spirit of the 19th National Congress of CPC and strengthening Party’s leadership on the University; constantly optimizing top-level design; high-degree recognition of the general principle of featured development; successfully being listed as a candidate institution for doctoral programs; new breakthroughs made in research bases; constantly improvement and enhancement of research competence and level; steady progress of human resources reform and achievements in high-level talents introduction and team building; implementation of requirements of Beijing Municipality and facilitating construction of New Campus; comprehensive enhancement of governance competence and improvement of service for students, faculties and staff. He requests that all directors and deputies shall be fully aware of development situation and requirements of higher education in Beijing as the Capital and all over the country. They shall deeply understand and grasp educational guidelines of the Party, actively adapt themselves to requirements of higher education development and reform, enhance their responsibilities in future work, apply what they have learned to practice and to improvement of their divisions, and build a high-level university with distinctive feature in information technology. In the end, Wang Yongsheng stresses on key issues in five major areas: firstly, party representative meeting of BISTU serves as a previous opportunity which will help facilitate comprehensively strengthening party building and plan for the future development so as to greet the 70th anniversary of foundation of People’s Republic of China. Secondly, we shall continue to raise level of education centering on approval of doctoral programs and salience of our feature in information technology. Thirdly, we shall contribute to the goal of cultivating talents for the New Era, build first-class educational system, and comprehensively improve competence and quality of talents. Fourthly, we shall further enhance political awareness and work together to complete construction of the New Campus. And fifthly, we shall systematically improve governance competence of the University. Deputy Secretary General Wang Xiuyan of CPC BISTU Committee also delivers a report. She raises new requirements for directors and deputies in four aspects, i.e., implementing organizational principles of New Era to complete appointment of directors and deputies; implementing the spirit of CPC and facilitating team building for loyal, clean, and responsible managerial staff; actually strengthening daily supervision of directors and deputies; and actually bringing role of directors and deputies into full play. Secretary General of Disciplinary Inspection Commission of CPC BISTU Committee delivers a report on inspection work, i.e., Constantly Facilitating on-campus Inspection to Build Perfect Pathway for Comprehensively Strengthen Party Discipline. She then lays stress on key issues and problems during inspection and reiterates disciplinary issues for directors and deputies. On the afternoon of 21st February, directors of 15 divisions introduces their division regulations and issues of key focus, which will be used as reference to rapidly improve administration competence of newly appointed directors and deputies. Group discussion is organized on the evening of the day. The training informs all directors and deputies of challenges and opportunities with which the University is facing in development. Says directors and deputies. They are now more clear of development goals, principles, guidelines, and key issues of the University. They will be more responsible, courageous, and diligent in future work to build a best university in Beijing. The morning of 22nd February sees President Wang Yongsheng delivering a report on “Implementing the Fundamental Mission of Education with Focus on Morality; Making Central Role of Talent Cultivation more Salient; and Investing all Efforts in Building a High-level University with Distinctive Feature in Information Technology. In the first part “Reviewing the History and Keeping Beginner’s Mind in the Pathway to Development”, Wang Yongsheng reviews history of the University, efforts we have invested, and breakthroughs we have made in past years. He says all faculties and staff shall keep beginners’ mind and continue to contribute to development of the University. In the second part, Wang Yongsheng introduces efforts of CPC BISTU Committee in constantly optimizing top-level design and clarifying educational orientation. He hopes that all directors and deputies further raise their political awareness, build planning for overall situation, broaden horizon, and contribute development of the University with their wisdom. In the third part, Wang Yongsheng lays stresses on 7 aspects to illustrate information feature of the University. And in the final part, Wang Yongsheng lists strength academic disciplines, featured academic disciplines, high-grade, precision and advanced academic disciplines. He stresses that we shall center on these features, comprehensively push forward reform and development, and speed up building a high-level university with distinctive feature in information technology. Wang Chuanliang summarizes the meeting and points out that the training is for the first time offers centralized training and explanation of working issues in the wake of appointment of directors and deputies. The training lays special focus on Xi Jinping Thought on Socialism with Chinese Characteristics for a New Era, closely relates to actual needs of the University, and achieves satisfactory results. He stresses that currently CPC BISTU Committee must adhere to new goals, new causes, and new arrangements of the Party when making planning for training of directors and deputies. We have to make training of directors and deputies a long-term project. He raises requests that firstly all directors and deputies shall bear mission in mind and be courageous in shouldering responsibilities. Secondly, all shall forge ahead with determination, enhance political awareness, consolidate political standing, work closely together to facilitate mass line campaign. And thirdly, all shall strictly adhere to disciplines and be honest and upright. Wang Chuanliang emphasizes that the New Era is a historically previous period for opportunities when we could make greater achievements. The three-step development strategy of the University is clear and clarified and has bright future. And we shall continue to work for even better tomorrow of the University.